Francine Perry (right) and her daughter Laura (left) share their testimonies at Bartlesville, First. BARTLESVILLE—The enemy meant to destroy them, but today they are destroying the enemy. In 2013, Francine Perry, a member of Bartlesville, First, started the Come Grow with Me Bible study with 25 women who met in a home for several years. Today, that study has grown to nearly 140 women from area churches who meet weekly in the Bartlesville, First worship center. It was during the growth of this Bible study that Francine and Paul Perry, along with their daughter Laura, went going through the trial of their lives—dealing with issues of Laura’s sexual identity. After almost nine years of living as a transgender male including years of hormone treatments, surgeries and gaining legal status, Laura was left empty and disappointed. She knew no amount of surgery would make her a man, and she admitted she was living a lie. Laura stepped out in faith, left her partner, job and entire life to surrender her life to Jesus Christ. Today she lives in freedom; redeemed and restored. 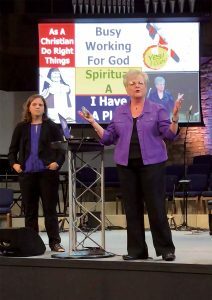 On Sep. 12, to celebrate the two-year anniversary of Laura’s coming home, Laura shared her testimony to a group of nearly 200 people at Bartlesville, First. That testimony titled “Former Transgender Set Free by Jesus Christ” can be viewed at www.comegrowwithmeonline.com. This was a pivotal moment of surrendering to the Lord and was a turning point for her. Laura recalls that it was the change in her mother, along with the Word of God Francine was teaching in her Bible study lessons, that God used to change her. “God used all the things I went through to change my mom. Our stories are deeply interwoven,” Laura said. The prodigal prayer basket contains names of nearly 500 people from all over the world. It was this very group of women in Francine’s Come Grow with Me Bible study who prayed fervently for Laura for years. They welcomed her home with complete acceptance and even provided funds for her to buy women’s clothing. Inspired by the miraculous answer to their prayers, a prodigal prayer ministry began. Now, as many as 40 women from several local churches stay for one hour after Perry’s Bible study every few weeks to stand in the gap and intercede for prodigals. 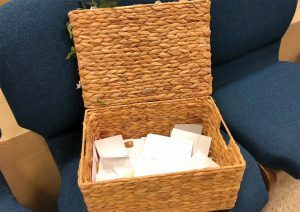 Nearly 500 people’s names from all over the world are listed on cards in a basket they call the prodigal prayer basket. To date, 16 names have been prayed out of the basket. To celebrate, these prayer warriors sing a chorus from the hymn “Ring the Bells of Heaven,” quote verses from Psalm 34, and have a time of praise. It’s the Perrys’ hope that other churches will include prodigals in their prayer ministries. For more information and resources, go to www.comegrowwithmeonline.com or contact [email protected]. 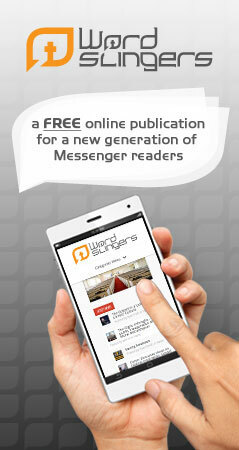 View more articles by Karen Kinnaird.